You’ve heard the term ‘Aging in Place’ but what does it really mean? In a practical sense, Aging in Place has important mental and emotional implications for seniors. It allows them the freedom and ability to make and be supported in their personal choices for as long as possible. 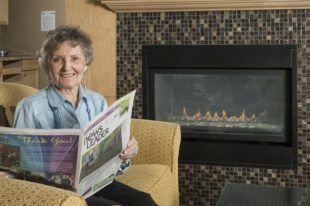 For seniors who are ready to leave their own homes but still wish to maintain a level of independence, consider a seniors community such as AgeCare, which was founded on the concept of ‘Aging in Place’. Seniors can live together in a warm, welcoming community atmosphere while receiving the supports they need if and when their care needs change. “I lost my wife and 2014 and just like that my whole life changed. My kids hustled me out of our home of 34 years in Midnapore and insisted I go into one of these seniors’ homes. I can tell you right now, I didn’t want to go. I thought I was perfectly able to stay on my own. I was quite upset at first. But now that I’ve settle in, I’ve really come to like it here. I feel comfortable and quite happy and I know I don’t have to move again. I play crib with some others twice a week and food is good . . . I never thought I’d say this, I’m old school . . . 83 now you know, but I’d recommend this for other old folks like me. It feels like a good way to live out my life,” said George Berg. For more information on Aging in Place, here is a series created by the Forum of Federal, Provincial and Territorial Ministers.